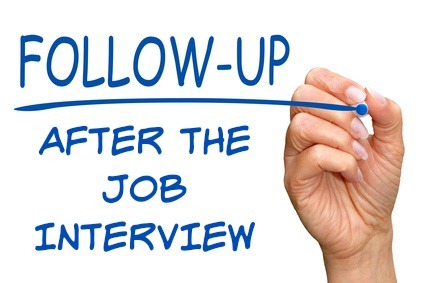 Strategic after interview follow up is an essential part of job interview success. Use this follow up help to follow up professionally and increase your chances of getting the job you want. 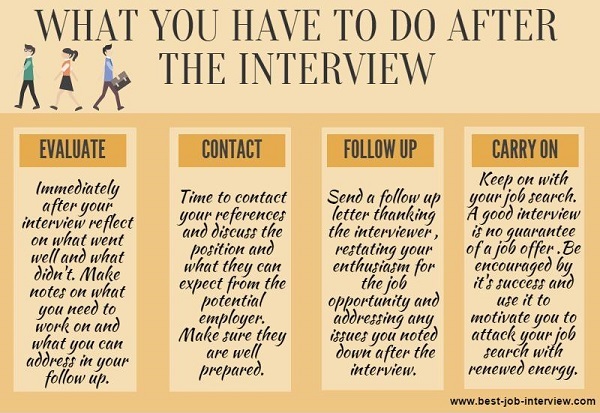 Following up effectively after your interview involves more than sending a thank you letter. Once your job interview is over, find out how to successfully manage the next stage of the hiring process. Take the actions you said you would in the interview as soon as you can. If you promised to send through your references do this as quickly as possible. If you don't follow through when you said you would you appear disinterested and disorganized. Make sure you pick up your messages and emails and respond to them immediately. If you are going to be out of contact for some reason send an email to let the employer know when you will be available again. Write and send your interview follow up email or thank you note within 24 hours of the initial job interview. Let your employment references know that they are likely to be contacted in the next couple of days by the company. A reference can make or break your chances of getting the job offer, it is far better for you if your references are well prepared. Give them some details about the job interview and the company so they have an opportunity to think about how they can highlight your suitability for the position. You can bungle your chances of getting the job by posting something inappropriate on social media. Comments about the interview, the interviewer, the company or your current job should be avoided. You do not know how these will be interpreted. Employers do use social media as part of their evaluation of job candidates so make sure you don't have anything posted that could ruin your chances. Use this social media checklist to send the right message to potential employers. 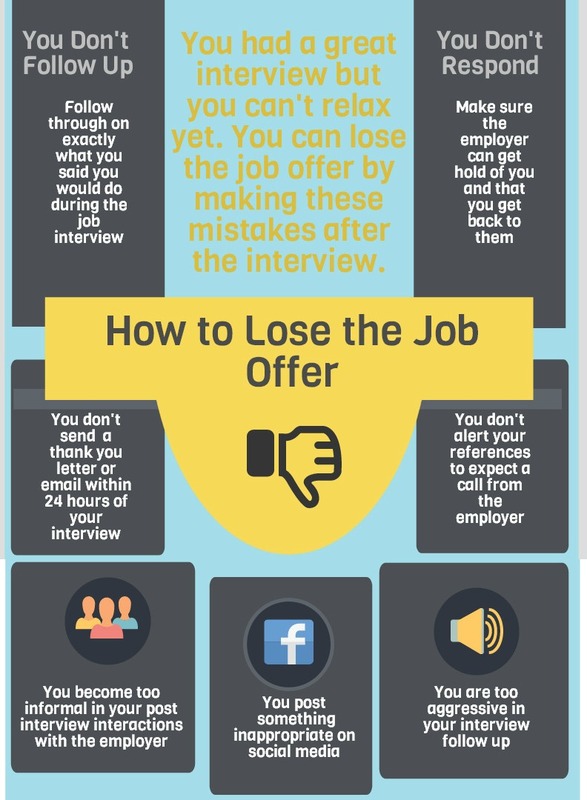 You can have a winning job interview but lose the job offer because of what you do after the interview. Proper follow up is key to securing the offer. After an appropriate time make the follow-up call, usually within a week or so of the job interview. Assess the situation and avoid overdoing the follow up calls. This can just become annoying for the employer. Find the right balance between staying informed and been seen to be too aggressive. You want to display enthusiasm for the position but avoid sounding pushy or desperate. "I would like to thank you gain for the opportunity to meet with you last week and also to restate my interest and enthusiasm for this job. I was hoping that you could give me an update on the status of my job application..."
Even if you are confident this is the position for you, it is never wise to rely on one job opportunity, there are no guarantees that you will definitely get the job. Knowing what other job opportunities are out there will help you when making the final decision about taking the job. You will be better able to evaluate the job offer in terms of the current job market. Another job offer puts you in a position of strength when asking for feedback. In a non-threatening way, let the company or recruiter know that you have received another offer and are considering it. You can restate your interest in the initial job but ask for a definite date for the hiring decision so that you can respond to the other offer. Use this example of what to say to help you. "Since our interview I have received another job offer. I am still very interested in your position but I would like to know when I can expect a final hiring decision. The other company have asked for my response by the end of the week." Be patient, hiring processes often take longer than initially anticipated. 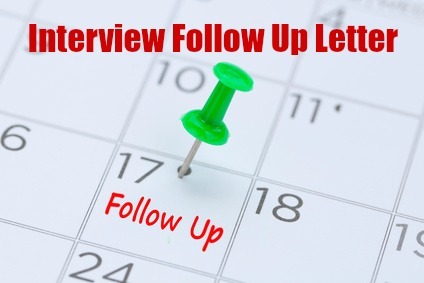 Just continue with your interview follow up at timely intervals. About once a week, you can alternate between politely phoning and emailing the company and asking them the status of their hiring decision. Interview thank you letters to select the appropriate sample thank you from. If you don't get the job, do not think of it as time wasted. You have made some important contacts at the company. You can send a short note to the hiring manager or human resources, thanking them for their time and asking them to keep you in mind for other suitable positions.